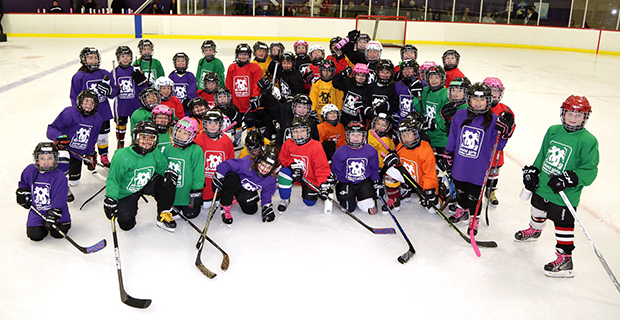 Just a few of the thousands of girls who have participated in World Girls Hockey Day. Considered one of the fastest growing sports in the world, women’s ice hockey is hoping to keep expanding their reach around the globe with the World Girls Ice Hockey Weekend. The World Girls Ice Hockey Weekend takes place Oct. 6 to 8, and is an opportunity for girls and women of all ages to try the sport. “On Oct. 6 to 8 we are asking that all Canadians who are hosting a celebration event of all sizes to tell us about their event. We will tally all events and be able to submit the total numbers of Canadians participating in events to the IIHF,” said Mandi Duhamel, manager of female development at Hockey Canada. Last year there were 471 events in 42 countries on six continents and the IIHF is hoping for even more success this year. From Australia and South Africa to the Northwest Territories, events were held from come and try sessions, meet and greets with national team players and exhibition matches. In Canada the game will be celebrated coat to coast through grassroots programming that is led by local communities, minor hockey association’s and families. “Together, the International Ice Hockey Federation and Hockey Canada are striving to grow the game of female hockey on an National and International Level, now you are helping us achieve this,” said Duhamel. This will be the seventh edition of the recruitment event to help grow women’s hockey around the world and spread the sport to new regions both in established hockey countries and new ones. The first event, held in 2011 saw almost 165 events in 20 countries and four continents. From small girls to adult women, the World Girls Ice Hockey Weekend is an opportunity to try out the sport in an organized event for beginners and to simply to have fun in a safe environment. The IIHF asks those involved to follow their tracker during the weekend on social media to see photos or search the hashtag #WGIIHW and use it when posting yourself. World Girls Hockey Weekend came from the success of World Girls Hockey Day, which was launched by the International Ice Hockey Federation (IIHF) in 2011. The following year, the event exploded to span a full weekend with double the amount of events. The 2013 WGHW featured the first long game, now a core part of the program. Canada’s long game kicks off in Newfoundland and Labrador in the morning and concludes in the evening in British Columbia. Typically, the Long Game pits Team Red vs. Team White in Atom, Peewee, Bantam, Midget, and Senior matches, resulting in a cumulative score of games nationwide.